Armenia’s illegal activity in the Azerbaijani territories harms the settlement of the Armenia-Azerbaijan Nagorno-Karabakh conflict through negotiations, said Hikmet Hajiyev, head of the foreign policy department of the presidential administration of the Republic of Azerbaijan, Trend reports with reference to the Azerbaijani Foreign Ministry. 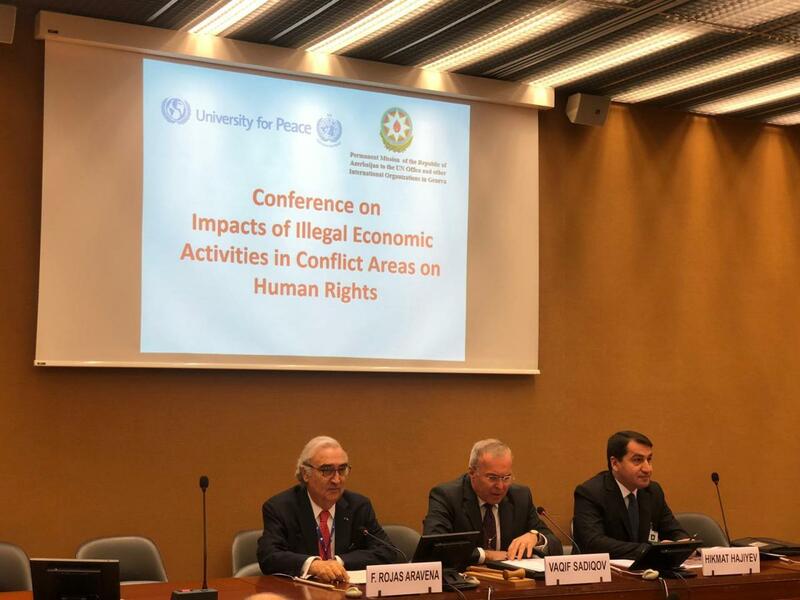 Hajiyev made the remarks at the international conference “Impact of Illegal Economic Activities in Conflict Areas on Human Rights” held in Geneva with the organizational support of the Azerbaijani missions to the UN and other international organizations, as well as the UN University for Peace. 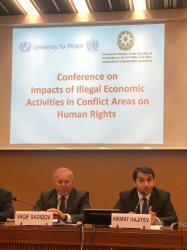 Vagif Sadigov, the permanent representative of Azerbaijan to the UN, who opened the event, announced the objectives of the event and spoke about the impact of illegal activities in conflict areas on human rights. Rector of the UN University for Peace Francisco Rojas Aravena stressed that in the absence of peace there will be no development and progress, and illegal activities will increase. 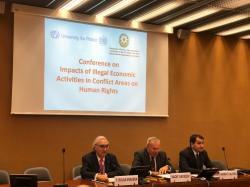 Hikmet Hajiyev in his opening speech noted that as a result of the occupation of Azerbaijani territories by Armenia, illegal economic activities were carried out there, resources were used illegally and property rights of IDPs were violated. In this regard, Hajiyev drew the attention of participants to a number of such practical examples and spoke about the illegal activities of the famous Swiss company Franck Muller, as well as Airbnb. He noted that the illegal activities carried out by Armenia in the Azerbaijani territories are detrimental to the resolution of the Nagorno-Karabakh conflict through negotiations and serve to protract the conflict. Hajiyev also stressed that Azerbaijan is making active contribution to the development and mainstreaming of the topic of illegal activities in the conflict areas. The conference was held with the participation of experts from Italy, the Netherlands, the UK and Azerbaijan in the form of two working sessions. During the event, representatives from Angola, Azerbaijan, the Democratic Republic of the Congo and Sierra Leone highlighted the current situation in these countries in this area. The speakers who delivered speech during the first session stressed that the respective states are responsible for the illegal activities of companies in conflict areas. During the speeches, the need to create specific instruments of binding nature in this area was noted. During this session, the speakers also voiced opinions on the resolutions adopted by the UN Security Council in connection with the Armenian occupation of the Azerbaijani territories, the decisions of the European Court of Human Rights in connection the case of Chiragov and Others v. Armenia, illegal remittances to the occupied territories and other issues. During the second session, the rapporteurs noted that other countries are responsible for non-recognition of the illegal regimes established in the occupied territories. During this session, Azercosmos OJSC presented satellite imagery showing the illegal economic activities of invading Armenia in the occupied Azerbaijani territories, environmental damage, burning forests and other violations. During this working session, the issue of the destruction of the material and cultural heritage in the conflict areas was also discussed, and information was provided that Armenia is pursuing a targeted policy in the occupied Azerbaijani territories aimed at the complete removal of Azerbaijan’s trace. 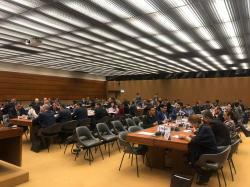 Permanent missions under the UN Office in Geneva, international lawyers conducting research on the topic, as well as more than 120 NGO representatives took part in the event.